Dwight Jones had a standout career with North Carolina and may have a second chance at the NFL after enduring a tragic loss. Dwight Jones is getting a chance to perhaps return to the game he loves, but he wants people to know the real reason he had to step away from the National Football League. 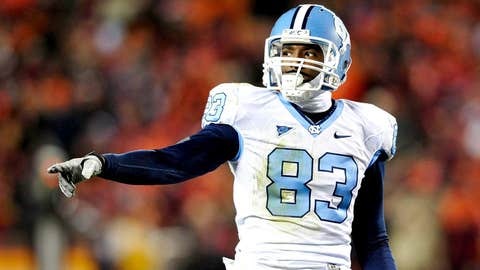 A one-time standout wide receiver for the North Carolina Tar Heels, Jones was signed by the Houston Texans after the 2012 NFL Draft. But he’s been absent from the NFL since the summer of last year. Jones tells the New York Post that many people at the time didn’t understand why he had to leave the game. "My son was born real sick," Jones told the Post. "A lot of people didn’t understand my story. They just thought I quit football. I didn’t just quit football. My son was real sick, and God put a burden on me not to play football at that time." Jones’ son was born in September of 2011, but suffered from a lung disease. He died in June of this year, the Post reports. "I didn’t want to play football," Jones told the paper. "I didn’t feel like it." But despite his struggling and grief, Jones credits his faith for helping restore his love of the game. "God has given me that feeling back that I love football," the Post quotes him as saying. The paper says Jones worked out for the New York Jets this week and was signed by Gang Green. The Post says he practiced with the team Wednesday for the first time in more than a year. "Once I get the rust off, I feel like I can get back into football mode," he told the paper. "I left some plays out there on the field today. I’m disappointed in myself. I made a big play at the end. … I see myself contributing to the team next year." Throughout it all, Jones said he never lost his faith in God and in himself, and that he’s thankful for his second shot at the NFL. "I’m here," he said. "God works in mysterious ways. A lot of people doubted me, said they thought I was done. I went out there today and to go against [Antonio] Cromartie, one of the best corners in the NFL, that was a fun challenge. I’m just happy to be back playing."